I’m a firm believer that Scouting is good for individuals and for society. Why do I support an organization started by an upper class white male over a century ago, an organization that has had its share of trouble? Because in spite of anything you’ve heard in the news in the past, I’ve experienced the benefits first-hand. My evidence is utterly anecdotal and completely biased, but absolutely heartfelt. When Thing One was 5, we put him in Beavers, so he could try it out and see if he liked it. Four years later, he moved on to Cubs, and Thing Two insisted that she was going to Beavers. I did try to direct her towards Guiding (another excellent movement), which I had gone through as a girl. As it happened, the year Thing Two was born, Scouts Canada became fully co-ed. She was determined to follow her brother. After a few years, I became a Beaver leader, then later a Cub leader. I joined because I felt it was my turn to help out by volunteering, to do my bit as a member of the community. I stayed because I was having fun, learning and feeling fulfilled and useful. Husband joined a couple of years later, becoming a Scout leader and later a group commissioner. We’ve been a Scouting family for almost two decades. We’ve been active and committed volunteers, and we’ve given many hours to the organization. I say this to put the following into perspective: the benefits to each of us and to our family far outweigh the efforts we’ve put in. We worked on joint projects, attended camps, food drives, tree planting and hikes together, worked towards common goals. Our family became part of the larger Scouting family. We’ve had many passionate discussions around the dinner table about leadership, plans and the movement in general. When Thing Two moved on to Scouts and then Venturers, I stayed with the Cubs. Turns out I enjoy eight-to-ten-year-olds immensely. I think it’s their energy, enthusiasm and openness, combined with their potty humour. Through Scouting, our children learned outdoor skills that were far above what Husband or I could teach. Wilderness first aid and survival, how to paddle a canoe through rapids, how to hike up or slide down a mountain, the proper way to launch bags of flour during the yearly Rovent siege. They organized and ran camps, training and conferences. Thing One discovered a passion for first aid, which helped him choose a career path. Thing Two has discovered her own skills as a leader — including managing a room full of people at least twice her age. Thing Two attended the 2015 World Jamboree in Japan along with 33,000 other Scouting folks, and now has a friend in Denmark. 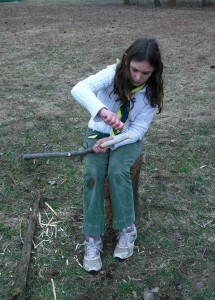 Husband and I have found that the leadership skills we learn in Scouting transfer well to our day jobs. Skills like mentoring, helping people succeed, and fostering leadership. And Scouting’s an excellent antidote to the world of work: there’s nothing like spending a weekend outside with a bunch of kids to put office politics into perspective. Scouting keeps us active and busy and helps us to feel useful, two key elements in a happy life. Volunteering is good for the people who do it and good for the community. Why not consider getting involved in an organization that works to empower young people — who after all, will run the world when we’re done — and has at its heart the idea of having fun with a purpose? Here are just a few of the ways you could benefit. Get regular doses of nature — it’s good for you! Fixate on a campfire instead of a screen. Who can resist poking a fire? Tuck thoughts of work or school firmly away and focus on the moment: hiking, setting up a sturdy shelter, making a perfect fire, channelling the energy of 25 kids. Learn how to silence a room with a simple hand gesture. Brush up on your first-aid training with real purpose. Learn how to make catapults using sticks and twine. Meet people of all ages and backgrounds whom you might otherwise never meet. Have things in common with 28 million or more people from 216 countries. Scouting has been a strong force for good in my community and my life. I’m humbled by the dedicated and fascinating volunteers and the inspiring kids I meet. If you’re looking to add some good to your life, while at the same time giving some good to your community, volunteering with Scouts is a great place to start. Tell me about your volunteering, or when a volunteer did good for you. Leave a comment or send me an email, at susan_at_goodbyegrumblings.ca. So are people who do a great job raising awareness of trees, especially in young ‘uns. Your work, Susan, makes a difference, here on your blog and out there with your Pack. Thank you very humbly, and I pass the thanks along to all parents and Scouters who dedicate time to good! a) When M&M were homeschooling, I used a lot of the various badge requirements for Brownies, Guides, Cubs, and Scouts as “curriculum” for the girls, and as a starting point for deeper study. Part of their writing work was composing descriptions of what they had learned. The program is well-rounded, interesting, and very practical. b) I agree that feeling useful is key to happiness of all ages. Teens need to feel useful and engaged in their communities, as do the elderly, and too often, neither age group does. c) Great post! You should consider submitting it to Scouting Magazine, if you have not already done so.